The new Miniplane ABM Rigid Cage Paramotor - 150cm cage diameter accomodates a 140cm propeller! The new reduction ratios make the propeller turn more slowly, only 2000 (16/75 Gearbox) or 2200 (17/75 Gearbox) RPM at maximum throttle. Thanks to this increased efficiency, during horizontal flight the noise is greatly reduced making the flight more relaxing for the pilot with less noise disturbance for those who are watching from the ground. The Top 80 is an Italian single cylinder, 2-stroke aircraft engine designed and produced by Per Il Volo for Powered Paragliding. 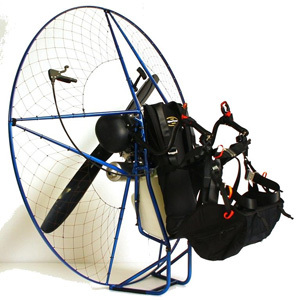 It was the first purpose-designed Paramotor engine! The Top 80 was developed specifically for the Per Il Volo Miniplane, which was introduced in 1989. The engine uses fan-cooling and a Walbro WG-8 diaphragm carburetor. Designed for light weight as the overall consideration, the engine weighs 10 kg (22.0 lb), plus the exhaust system weight of 1.5 kg (3.5 lb - NEW Aluminum Style). With the Walbro carburetor the Top 80 produces 11 kW (14.8 hp) at 9500 rpm. Power is delivered to the two-bladed wooden propeller though a reverse-turning gear box to reduce output net torque felt by the pilot during acceleration and deceleration. The oil filled gearbox can be fitted with 22/70 gears giving a reduction ratio of 3:182, 21/71 gears giving 3.381, 20/72 gears giving 3.60, 19/73 gears giving 3.842 or 18/74 gears with a ratio of 4.111. 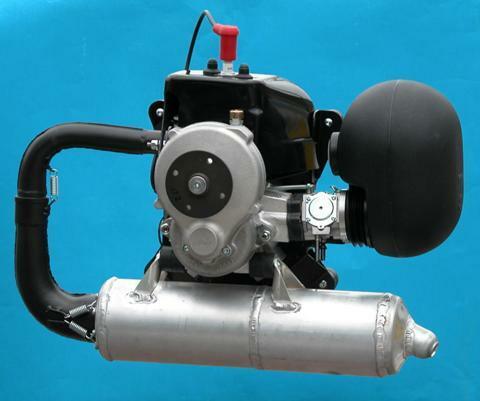 The engine also features a centrifugal clutch that allows idling without turning the propeller, a useful feature in its main application on a paramotor, where it improves ground safety. This tiny, lightweight motor first became popular in Europe, especially with competition pilots. It's light weight and low fuel burn for the power produced made it perfect for competition pilots and everyone else. It can get over 100 lbs of thrust with a 48" prop. 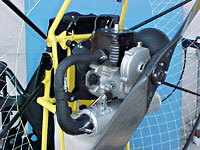 Miniplane, the builder, was first to put it on their paramotor frame but soon began selling the engine others. Many instructors complained about maintenance issues because certain aspects were difficult to troubleshoot and repair. For example the dreaded power fall-off, where it goes to full power for a few minutes then tapers down. The pull start system is a bit challenging to work on and, depending on the problem, can require removing 15 or so rivets to get to it. The cooling fan is housed in that same unit so it must be deriveted (which admittedly is surprisingly simple) to replace. This motor, like all small displacement machines, gets its power by running at high RPM - over 9000 - so it requires more frequent rebuild if run hard. Throttle response is quite good on a properly running motor. I've heard pilots complain about this and indeed I've flown those with a slow response but that's because there's a problem. A normally running Top 80 is quite nimble. This is probably the most impressive motor for the amount of power delivered per pound of weight.